Hallucinogenic mushrooms have been part of human culture as far back as the earliest recorded history. Ancient paintings of mushroom-ed humanoids dating to 5,000 B.C. have been found in caves on the Tassili plateau of Northern Algeria. Central and Southern America cultures built temples to mushroom gods and carved "mushroom stones". These stone carvings in the shape of mushrooms, or in which figures are depicted under the cap of a mushroom, have been dated to as early as 1000-500 B.C. The purpose of the sculptures is not certain, but they may have been religious objects. 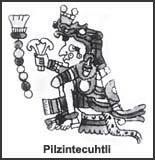 The Mixtec culture of central Mexico worshipped many gods, one known as Piltzintecuhtli, or 7 Flower (his name presented in the pictoral language as seven circles and a flower) who was the god for hallucinatory plants, especially the divine mushroom. The Vienna Codex (or Codex Vindobonensis) (ca 13th-15th century) depicts the ritual use of mushrooms by the Mixtec gods, showing Piltzintecuhtli and 7 other gods holding mushrooms in their hands. With Cortez's defeat of the Aztecs in 1521, the Europeans began to forbid the use of non-alcohol intoxicants, including sacred mushrooms, and the use of teonanácatl ('wondrous mushroom', or 'flesh of the gods'2) was driven underground. According to Sahagún, the psychoactive mushrooms which were ingested by the Aztec priests and their followers were always referred to as teonanácatl though the term does not appear to be used by modern indians or shamans in mesoamerica. 3 The varieties most likely to have been used by the Aztecs are Psilocybe caerulescens and Psilocybe mexicana. Psilocybe cubensis, which is currently quite popular as it is easy to locate and cultivate, was not introduced to America until the arrival of the Europeans and their cattle. The investigations of Schultes and Reko came to an end during World War II, and little more was learned until the early 1950's when amateur mycologist R. Gordon Wasson, and his wife Valentina Povlovna, became interested in the traditional use of mushrooms in Mexico. In 1953 Wasson and a small group travelled to Huautla de Jimenéz where they observed an all night ceremony under the guidance of a shaman named Don Aurelio. Two subsequent trips to Mexico led to meeting the Mazatec curandera Maria Sabina who on June 19th 1955 provided Wasson and his companion photographer Allan Richardson with Psilocybe caerulescens during a Velada (mushroom ceremony). In 1956, Heim requested help from Sandoz Pharmaceuticals (a Swiss company) in extracting the active ingredients of the mushrooms. Albert Hofmann, a research chemist at Sandoz, soon isolated psilocybin and psilocin and developed a synthesis technique. Wasson continued to travel to Oaxaca over the next few years, and with Roger Heim published the first widely distributed article about psychoactive mushrooms and the Mazatec Velada in the May 13, 1957 issue of Life Magazine. Though recreational use continued, research halted through the '80s and '90s due to strict govermental controls, but in recent years, psilocybin and its effect on the human mind has once again become the subject of scientific study. 7. 21 USC Chapter 13 Sec 812. Drug Abuse Prevention and Control Act of 1970 aka the "Controlled Substances Act of 1970".